RIDOT's latest victim: I-280 falls to Square-Shield Syndrome. 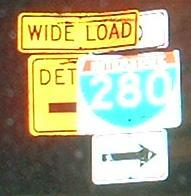 I-280 is mostly a six- to eight-lane freeway that never stops moving. In Newark, it becomes a four-lane freeway that always stops moving. This has nothing to do with the Stickel Bridge, one of the last drawbridges on the Interstate Highway System, but rather, the fact that the viaduct leading up to it is only four lanes tends to cause the problems. This wasn't because of design, this was because of circumstance. The NJ 58 viaduct opened from Orange Avenue, just east of current Exit 13, eastward in 1949 as NJ 25A, across the Stickel Bridge and down to Harrison St. at current Exit 16. It then became NJ 58 in 1953, and briefly had a sister route named NJ 158 (a converted railroad drawbridge to the south that was then torn down). I-280 didn't come tearing through Essex County (and I do mean through in the case of Orange/East Orange) until 1971, and between a historic church and the New Jersey Transit railroad tracks, there was simply no room to expand 58 or bring it up to date. The only piece of NJ 58 that hasn't been entirely coopted by I-280 (and even the curb on 280 is original) is a tiny stub over the railroad tracks at the very western end of Orange Avenue, and I do link to photos of that stub below. That history explains why the highway has no shoulders, 500-foot weave areas, unsigned merges, and stop signs on entrance ramps. It also explains why most of the Newark-side ramps are EB on/WB off - the viaduct was really only intended for cross-river traffic, not cross-town. 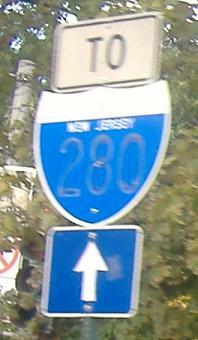 Left - On Walnut St. NB, Essex CR 607. As a side note, even as the new NJ 21 interchange advances through the planning process, such that all traffic will actually be able to use Exit 15 - safely! - instead of local streets, the Stickel Bridge is also being studied for replacement, which it will soon need. Of course, any new bridge would require ramps to be relocated once again, and of course since the new bridge would be much higher, the ramps would have to come down a considerable distance to the ground.